At StickerYou we are always making improvements to our products and services so it is easier for you to Make Your Message Stick! 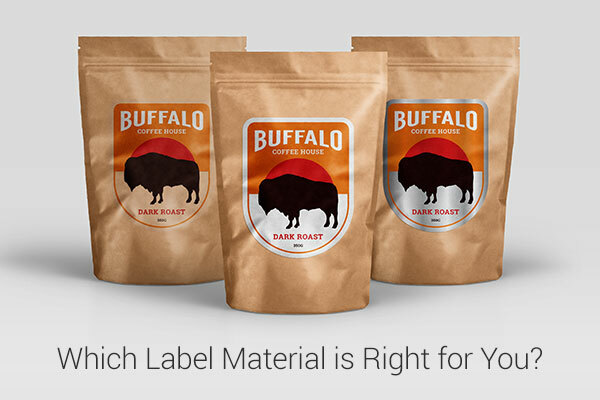 We decided to revisit one of our most popular products, Labels. 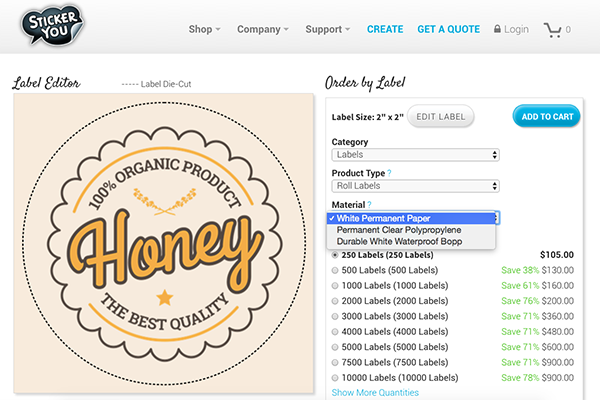 StickerYou provides two main types of custom labels: Roll Labels and Custom Labels on sheets. If you are looking for less than 250 labels then you can always order our Custom Labels which are vinyl labels printed onto sheets. You won’t be able to add a sheet of custom labels to a Label Dispenser as you can with our roll labels, but they are ideal if you need 100 labels or less. 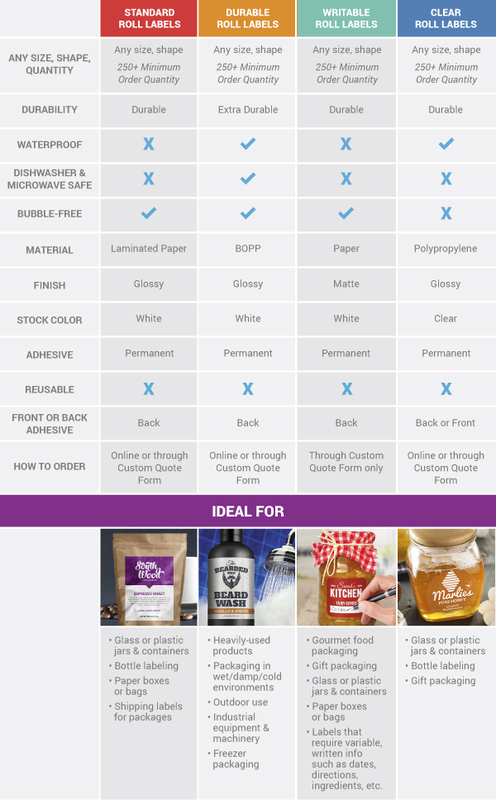 Our pages can be designed for a single label short run, or you can add multiple label designs to a single sheet if you have a variety of scents or flavors. Our vinyl labels are also bubble free so you can apply them with confidence, knowing the application will be perfect every time. Durable Roll Labels or BOPP Labels (Biaxially Oriented Polypropylene - essentially a plastic based label) are ideal for labeling products that require extra durability. They are water resistant, UV fade resistant, oil resistant, heat resistant and abrasion resistant, making them truly durable for products from the health and beauty, beverage, or industrial application needs. They also last well on products that will be used outside. 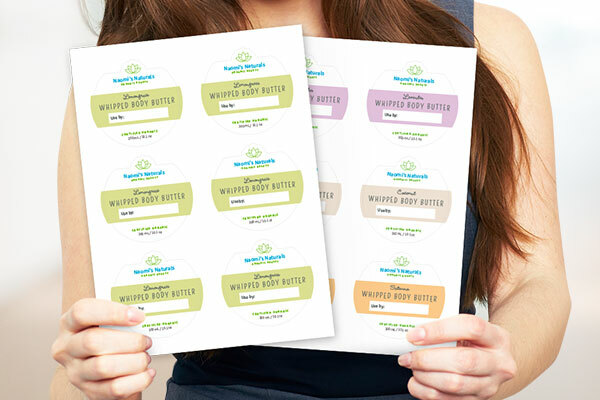 Matte-Writable Roll Labels & Matte-Writable Label Sheets are a quick and easy way to label your products while customizing each label manually with a date of production, best before, or flavor or scent categorization. These labels also offer the most ‘organic’ look and feel as they have no gloss and are appropriate for products that have a ‘natural’ positioning such as certain foods and beauty products. Silver Foil Labels add a high-quality, luxurious look to your product. The SILVERVAC material gives your packaging the extra oomph it deserves. They can be used for industrial, consumer product and apparel packaging, as well as event packaging like birthdays, anniversaries, marriages and more for that stylish or flashy look you're going for. Gold Foil Labels are printed with a shiny, metallic finish, these gold foil stickers are perfect for sealing gift boxes or packaging and give your products an elegant look. Paper (Standard) Roll Labels are a quick and easy way to order custom labels in bulk and at a reasonable price. Paper Roll labels are easy to dispense and distribute. They are the most popular economic choice for blank packaging label branding. Clear Roll Labels & Clear Label Sheets have great full-color reproduction, which will ensure your logo or label design looks great - particularly on glass objects. Perfect for Honey or Jam jars and Beer bottles, the durable, tear-proof material with permanent adhesive will help keep your label intact and in place on your product. Once you have designed the perfect label in our Label Editor, click the blue “Done Editing” button, then you can select your label material. In the order details, navigate to the "Material" drop-down and you will see all of the available material options. Select the material that fulfills your packaging requirements based on the features in the above chart and then specify your other order details like label quantity. Note: Only Silver Foil, Standard, Durable, and Clear Roll Labels can be designed on our website. Writable and Gold Foil Roll Labels can only be ordered by filling out a custom quote form. - Labels are usually priced per label or per sheet, and price breaks exist at certain quantities. You can see the price breaks when selecting your quantities or a sales representative will be able to advise you on where these price breaks exist. - Pricing for labels is based on the size of the labels and the quantity you wish to order. - Specialty effects are available for roll labels; foil effects, embossing, debossing, spot UV coating and perforated rolls. To find out more about these effects or add them to your roll order, request a custom quote. 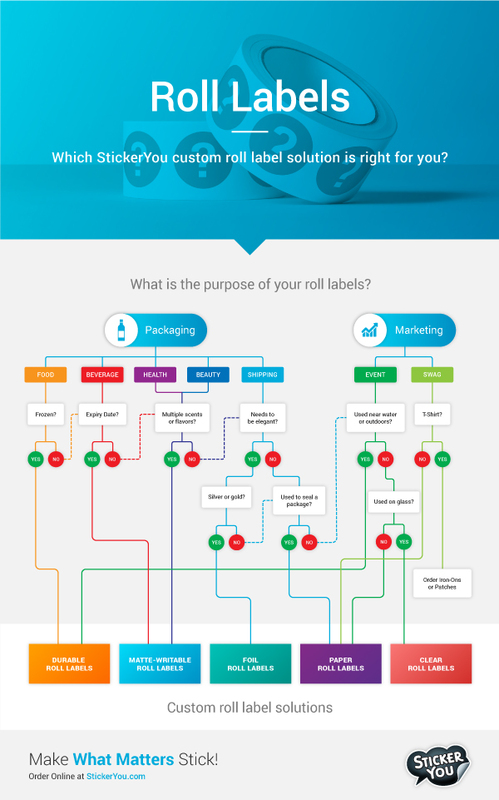 - Roll labels will be delivered as rolls, not as single stickers or labels. Got another project on your mind? Read more about StickerYou's product quality or test out all of our most popular materials yourself by requesting a free sample pack!